I have been looking for a fast, well supported VNC or remote desktop application to view my windows machine desktop from my ubuntu laptop. Any suggestions for me? Note: It's installed by default since 12.04. I've always used KRDC. It just works. Vinagre is now the default client in ubuntu. I had issues with remmina in fullscreen mode, vinagre works as a charm. noVNC (GitHub) is a browser-based app supporting many VNC features but no RDP. VirtualBox has a built-in vRDP protocol that can be used to access GNU/Linux remote desktops (Linux distro usually lacks a RDP server). The vRDP protocol is compatible with all RDP clients. However, the proprietary VirtualBox Extension Pack is required. See also this good comparison of remote desktop software (Wikipedia). 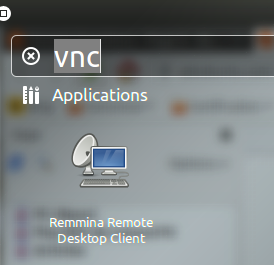 VNC remote doesn't work with Ubuntu? How can I change the default port of Remote Desktop (VNC)? What is the default VNC server included?